When you visit Florence as we did this week, you cannot avoid seeing the Duomo and you will almost certainly walk past it, even if it is not on your list of things to do. Cathedrals took hundreds of years to build and when the Duomo in Florence was started no one knew how they were going to build the giant dome that was planned. 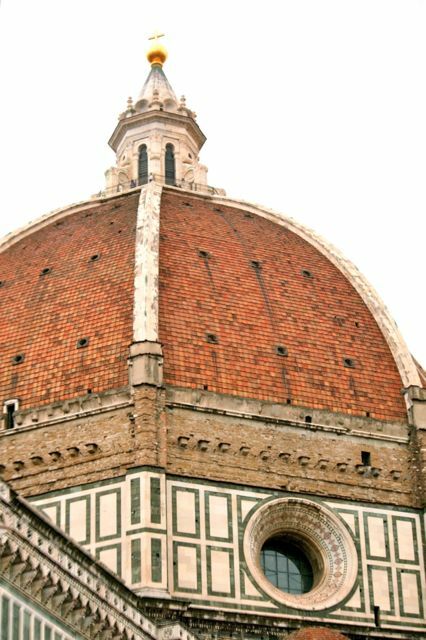 The solution to building the dome was found by Filippo Brunelleschi, Renaissance man and Florentine. After losing out to Ghiberti in a competition to make the Baptistry doors, he spent a few years in Rome studying how the Romans had done things. Still, no-one knew his idea would work until the dome was built, the dome is not hemispherical in shape and there is actually an inner and outer dome that were connected together with wooden supporting beams. The domes supported themselves as they went up and Brunelleschi designed many of the winches to take materials to the top – machinery that Leonardo da Vinci would have seen and no doubt studied as he grew up. If you climb to the top of the dome you actually walk between the inner and outer domes, look for the herring bone brick patterns that give the dome extra strength. It was an overcast cold winter’s day, not the best conditions for taking outdoor photos, so I decided to concentrate on capturing a few details around the Duomo, the Bapistry and Giotto’s Bell Tower.